All games in tagged with "Adventures of Dr. Franken snes"
Dr. Franken was a video game released for Game Boy and Super NES by Elite Systems. 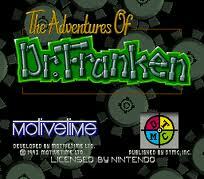 It was titled The Adventures of Dr. Franken for the SNES in the United States. The game features Franky, a Frankenstein's monster on a mission to collect the scattered body parts of his girlfriend.Prototype NES and Sega Game Gear versions were developed around the same time, but never officially released. A sequel, Dr. Franken II, was released on the Game Boy in 1997.